Welcome to Loukoumi. We are artisan confectionery Manufacturers specializing in traditional handmade 'Turkish Delight'. Our products are exquisitely handcrafted; we only use natural flavours and never use any preservatives or gelatine. We believe our patience and experience creates a sweet that is worth indulging in. We are passionate about what we make, the long history behind the product has lent inspiration for the creation of new and interesting, mouthwatering flavours. We do of course make the well known Rose and Citrus flavours but also provide a wider range of non-traditional and unexpected taste treats. The origins of the product are in what was Persia as far back as 800 AD - it has proliferated throughout the Middle East as empires waxed and waned and the conquering forces took their food to new places. Currently variations can be found in all the countries of the old Arabian peninsular, across the southern Mediterranean, Turkey, Romania, Bulgaria and into the south western Russian states as well as Greece , where the Loukoumi brand name originated. The term "Turkish Delight" was apparently coined by a British traveller in the 1800's who went to Turkey, loved the product, bought up large and when it was ready for distribution at home he couldn't remember what the product was called and made up the "Turkish Delight" name. A rough translation of the terms in Arabic and many of the other languages is roughly " soothes the throat " or "quiets the voice". What sets our offering apart from anything offered through the supermarkets is the literal "melt in the mouth" texture. Most commercial products are made with gelatine or artificial setting agents which make it easy and quick to produce but the chemistry is such that it will never dissolve in your mouth. Our offering is softer, and we have a delicious range of flavours; the product is all natural, vegetarian ( the non-honey flavours are vegan) and complies with both Kosher and Halal requirements. We trust you will be tempted by our product, will purchase and will enjoy the unique taste and texture experience. Feel free to contact us for further information but meantime tempt your taste buds and palate wandering through the listed offerings; buy some and indulge yourself or a loved one. 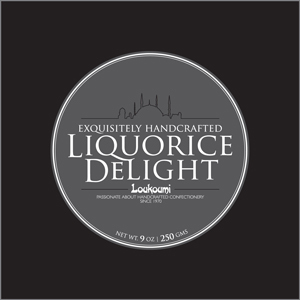 LOUKOUMI… PASSIONATE ABOUT HANDCRAFTED CONFECTIONERY AND MADE IN NEW ZEALAND SINCE 1970.